ARE COVER CROPS A SOLUTION? ALGAE BLOOM ON LAKE, OCTOBER 2016. THE RE-OCCURRENCE OF harmful algal blooms (HABs) in Lake Erie has once again raised questions around how we manage phosphorus (P) on farmland and ways to control or limit the sources of P entering surface waters. Although other nutrients such as nitrogen may influence some of the characteristics of HABs in fresh water systems, P is the main culprit for their occurrence and severity. Controlling P loading to surface water bodies is essential. In the 1960s to early 1970s, Lake Erie was experiencing significant problems related to HABs, leading to the formation of the Great Lakes Water Quality Agreement in 1972 and measures to tackle the P problem. At that time, total P loading was estimated to be ~29,000 tonnes per year, and a target loading of 11,000 tonnes per year was established to return the Lake to a healthy status. Point sources of pollution, such as sewage treatment plants, were the major sources of P entering the lake, and large investments in water treatment infrastructure helped to achieve the targeted loading rate. On the farming side of things, the focus was on reducing soil erosion based on the assumption that with low solubility and a strong affinity for soil particles, the dominant pathway of P loss would be through erosion. The Lake recovered, and for the most part HABs disappeared. All was fine for a few decades and then around the mid-1990s Lake Erie started experiencing HABs again with a record breaking bloom in 2011 and followed by another record breaker in 2015. The HABs in 2013 and 2014 had the added issue of having a species of algae, Microcystis, capable of producing toxins. In 2014, the concentration of the microcystin toxin in Toledo, Ohio’s drinking water made it unfit for consumption. For the most part, the 11,000 tonnes per year target was being met. So what changed? There is evidence that recent HABs may have been influenced by a changing climate and introduction of invasive species, such as the Zebra mussel, however the underlying problem is still too much P. While before P sources were primarily from point sources, today more than two-thirds of the P entering Lake Erie is attributed to non-point sources and that is where agriculture plays a part. When we look at P loss from farmland we can view it as being in two different forms. Particulate P is P bound to soil particles and typically is the dominant form of P lost from most fields. It was this form of P that was targeted through practices such as conservation tillage, grassed waterways, buffer strips, etc. It is important to note that not all of the particulate P is available to algae, maybe only 10 to 30 per cent. The other form of P lost is dissolved or “reactive” P and although usually lost in smaller amounts, it is 100 per cent available to algae. Since the mid-1990s, we are seeing higher and higher concentrations and loading of dissolved P entering the Lake, and this would seem to be the cause of the reoccurrence of HABs. New targets for Lake Erie are now calling for a 40 per cent reduction in both total P and dissolved P entering the Lake. A ROLE FOR COVER CROPS? Greater attention on soluble P losses has led us to reconsider some of the management practices that we have been using primarily to control particulate P losses. For example, no-till is an excellent practice for controlling soil erosion and thus particulate P losses. However, long-term no-till can lead to a stratification of P in the soil, with P being in a higher concentration at or near the soil surface. It is the P in the top one inch or so of soil that reacts with runoff water, with higher soil concentrations resulting in higher concentrations of dissolved P in the runoff water. At first glance, this may sound like a bad situation, however we have to consider other factors as well. Does the reduction in losses of particulate P outweigh the potential increase in dissolved P concentrations? Remember each form has a different availability. Does no-till alter the amount of runoff generated? What is the net export of P from the field on an annual basis? Our studies in Ontario would suggest that no-till does not appear to increase the risk of soil P loss as dissolved P, although P inputs may be a different story depending upon soil test levels and management practices. Cover crops are another management practice that has come under question regarding potential losses of dissolved P. Similar to no-till, we know there are numerous benefits to cover crop usage. They too can aid in erosion control, as well as improve soil organic matter content and overall soil health. Unfortunately, a portion of the P in the cover crop biomass is released when plants freeze and thaw, leading to elevated concentrations of dissolved P in spring runoff from cover cropped lands. It is not clear, however, whether we should consider cover crops a poor management practice for mitigating soluble P losses. Different cover crops species have different amounts of P uptake and different susceptibilities to P loss following freeze-thaw cycles. The minimum temperature and number of freeze thaw cycles is also important. Areas with greater snow cover or milder winters may not experience as great a P release from the cover crop biomass. The negative aspects with respect to P loss would possibly be diminished in these situations. We know soil test P levels definitely affect the concentration of both dissolved and particulate P in runoff water. Cover crop P uptake and loss upon freezing, while expected to increase somewhat with increasing soil test, may not increase as rapidly as the impact of soil test P level. Thus, on higher P testing soils, cover crops may still be a useful management practice. To address these important questions we have undertaken a novel two-year research project that examines the effects of soil test P concentration and cover crop species (mustard, rye, oat, and red clover) and age on plant P uptake and release after freezing and thawing events. Preliminary results indicate less mature plants lose a greater proportion of their P after freezing and thawing, which is what we would expect. More mature crops lose less of their P with the freeze thaw cycle, but also have more P to lose, so the net impact on potential P loss is not straightforward. Preliminary results also suggest that although P uptake by the cover crop increases when Olsen-P soil test increases from 10 to 20 ppm, further increases in the soil tests above 20 ppm does not appear to affect either biomass production or P content. To examine the net impact of cover crops on P losses, we will use cover crops grown in runoff boxes at two field sites (one in each year) and then under controlled environment conditions, subject the plants and soils to freeze-thaw cycles followed by snowmelt and rainfall runoff events to monitor P loss. These results will provide us with a better understanding of the inter-relationships between cover crop species and soil test P levels on amounts and forms of P lost in snowmelt and rainfall events from cover cropped and bare soils. The goal is to identify conditions where we can confidently consider cover crops to be an effective management practice for mitigating P loss. Dr. Ivan O’Halloran is a soil fertility and nutrient use efficiency associate professor within the School of Environmental Sciences at the University of Guelph Ridgetown Campus. 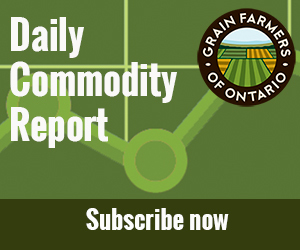 Grain Farmers of Ontario is a founding member of Grow Ontario Together (GOT). GOT is a collaboration of agriculture organizations that recognize the need to work together — with each other, with the public, with environmentalists, with municipalities, with concerned citizens, and with governments — to provide leadership that supports the triple bottom line for Ontario: a healthy environment, a healthy economy, and strong, healthy communities. 4R Nutrient Stewardship – a globally recognized approach based on the core scientific principles of applying the RIGHT SOURCE of plant nutrition, at the RIGHT RATE, at the RIGHT TIME, and in the RIGHT PLACE to improve nutrient use efficiency to reduce any potential nutrient loss into the environment. Investing in modern infrastructure and other sophisticated technologies to manage water use and recycling — improving the efficient use of nutrients and reducing or eliminating nutrient loss into the environment. Working in partnership with the provincial and federal governments to provide farmers with the tools they need to improve nutrient management practices on their farms – this includes support, incentives, and regulations. Conducting and supporting better monitoring research activities to ensure that the collective efforts are having the right reduction impacts. Working with partners to educate farmers, environmentalists, governments, and citizens to allow everyone to play their part.